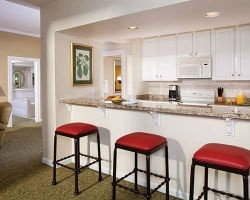 The beauty and history of Hilton Head Island awaits you at your very own accommodations within Marriott's Harbour Club. Find timeshare resales and rentals at the resort instantly today. What’s My Marriott Timeshare Worth? Located in the charming area of Harbour Town, the Marriott Harbour Club resort provides a complete vacation experience filled with stunning amenities. Incorporating a distinct colonial-inspired design, the Harbour Club offers meticulously maintained grounds and impeccable convenience to create a perfect vacation atmosphere. Guests will have plenty to do between the resort's swimming pool and incredible proximity, which puts guests within walking distance to shops at Harbour Town, deep sea fishing charters, and scenic golf courses. Perfect for family retreats to the beach, the Marriott Harbour Club will provide memorable vacations year after year. The accommodations at the Harbour Club come in the form of luxurious two bedroom villa-style units. 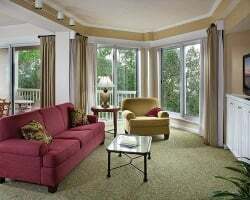 Equipped with homelike features and modern furnishings, your group will have enough space and comfort to properly enjoy your Hilton Head escape. Ideal for groups of up to six, you'll find your timeshare villa comes complete with full kitchens to prepare your own meals, gorgeous balconies overlooking the water or resort courtyard, and whirlpool-style bathtubs perfect for unwinding with a bottle of wine. Are you ready to find your guaranteed accommodations in Hilton Head? Fill out the form on this page to learn more about owning a timeshare at Marriott's Harbour Club, or call a representative at 1-877-815-4227. Owning a timeshare at Marriott's Harbour Club can provide you with a distinct vacation experience each and every year. However, buying that timeshare on the resale market can earn you all the same great perks for thousands less. Resales at the Harbour Club are sold by their current owners instead of by the resort itself, which means you'll find much more affordable prices than you would by purchasing straight from the resort. You can find exclusive ownership opportunities at the resort for prices up to 70% lower than retail costs, giving you the deal of a lifetime. You can find timeshare resale units at the Harbour Club available in deeded fixed and floating weeks spread across Marriott's Preferred, Value, Sport, and Summer seasons. The great deal of variety on the resale market means you can find a timeshare with the right price point and unit size that matches your vacation preferences. Additionally, more opportunities to reap even more rewards can be yours if you join the Marriott Vacation Club. The Harbour Club resort is affiliated with Marriott Vacations Club, one of the largest and most popular vacation clubs in the world. As a resale owner at the resort, you have a prime opportunity to join the club and take advantage of its many exclusive perks and benefits. Upgrading your deeded Marriott timeshare week to Marriott Vacation Club Destinations points will allow you to make easier reservations at the Harbour Club as well as other Marriott timeshare locations in desirable destinations around the world. Additionally, you'll be able to access owners-only features at certain resorts, like clubhouses, lounges, and more. 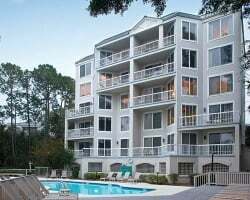 The Marriott Harbour Club Hilton Head is also affiliated with one of the world's most popular timeshare exchange brands, Interval International. Exchanging your timeshare is a great way to maximize your resale ownership—it allows you to explore other vacation possibilities in destinations all over the world through a seamless trade process. Simply deposit your Harbour Club timeshare into the exchange network and trade for stays at comparable resorts worldwide. Additionally, since the Harbour Club is a Premier-rated property, those other comparable resorts will be of a high quality similar to the Harbour Club. This stunning resort from Marriott truly has it all. At the Harbour Club, you'll find no shortage of on-site amenities and services geared toward making your vacation experience relaxing and convenient. 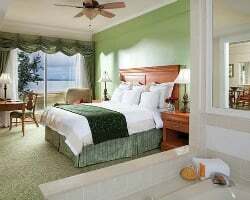 Walk to the beach or relax by the resort's outdoor swimming pool and hot tub under the famous South Carolina sun. Visit the fitness center to stay on top of your exercise goals, or take advantage of the resort's restaurant delivery service to dine in. Consult the resort's concierge to make reservations at popular local restaurants or to find things to do. Speaking of things to do, you'll find all of Hilton Head's best attractions within a convenient distance from the Harbour Club. Explore shops, sailing excursions, or deep sea fishing adventures at Harbour Town, or head a little further away to spend the day at the popular Coligny Beach. Golfers will love staying at the Marriott Harbour Club Hilton Head as well, as it's just minutes away from fantastic courses like the Harbour Town Golf Links and Heron Point. Outdoors enthusiast will find Hilton Head welcoming, with plenty of inlets and waterways along the Harbor River ripe for kayaking and a world of hiking at the Pinckney Island National Wildlife Refuge. Already Own at Marriott's Harbour Club?